Damsels are members of the Pomacentridae family, encompassing 29 genera and 385 species. Damsels are a commonly kept group of fishes due to their extremely hardy nature, low cost and bright coloration. The Blue Devil Damsel (Chrysiptera cyanea) is one of the most commonly sold damsel species. Some other damsels often seen in the aquarium hobby are the Three Spot Damsel (Dascyllus trimaculatus), Four Stripe Damsel (Dascyllus melanurus) and the Yellowtail Damsel (Chrysiptera parasema). Damsels are found in all the world’s oceans. Though many of the species represented in the aquarium trade come from tropical coral reefs, many damselfish species are found in temperate waters as well. They can range in size from 2” (5 cm) to 14” (34 cm). Damselfish exhibit a wide dietary preference across species, with some species “farming” algae on the rocks within their territory. Other species are primarily zooplanktivores, consuming foods from the water column such as copepods and mysis. Damsels make great aquarium inhabitants, provided their husbandry needs such as diet, water quality and tank space are met. One of the most important care considerations for damselfish is their temperament. Some species can become rather pugnacious in captivity, and it is important to keep this in mind when selecting tankmates for damselfish. Most damselfish prefer a temperature range of 72F (22C) to 80F (26C), though some species such as the giant Garibaldi Damselfish (Hypsypops rubicundus) require much colder temperatures. It is always advisable to research the particular species you are considering keeping before purchase. Damselfish are generally considered reef safe as they do not harm corals or ornamental invertebrates. 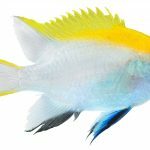 It is important to consider carefully what species of damselfish may be best for your aquarium. 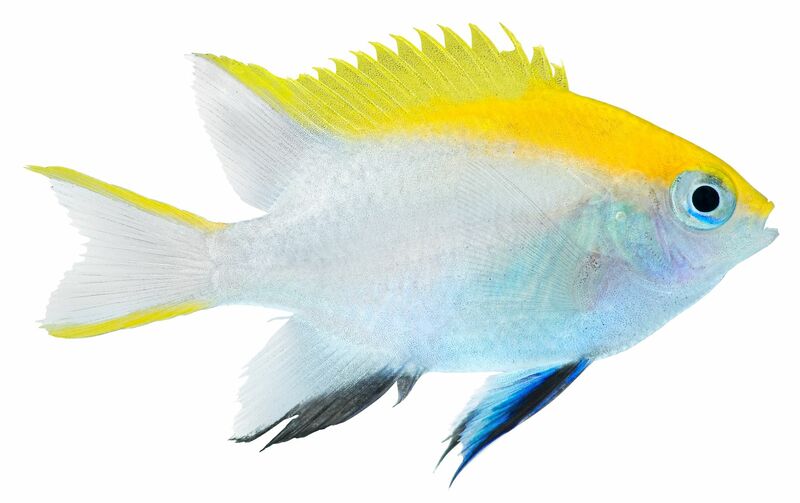 While smaller species such as the Blue Sapphire Damselfish (Chrysiptera springeri) are suited to tanks as small as 10 gallons, larger species such as the Velvet Damselfish (Paraglyphidodon oxyodon) may be better suited to a larger aquarium.